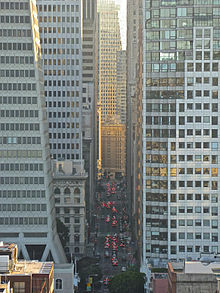 The Financial District is a neighborhood in San Francisco, California, that serves as its main central business district. It is home to the city's largest concentration of corporate headquarters, law firms, insurance companies, real estate firms, savings and loan banks, and other financial institutions. All six San Francisco Fortune 500 companies—McKesson, Wells Fargo, PG&E, Gap, Charles Schwab, and Salesforce.com— are located in the district. The area is marked by the cluster of high-rise towers in the triangular area east of Kearny Street, south of Washington Street, west of the Embarcadero that rings the waterfront, and north of Market Street. The city's tallest buildings, including 555 California Street and the Transamerica Pyramid, and many other tall buildings, such as 101 California Street and 345 California Street are located there. Montgomery Street (sometimes called "Wall Street of the West") is the traditional heart of the district. Since the 1980s, restrictions on high-rise construction have shifted new development to the adjacent South of Market area surrounding the Transbay Transit Center. This area is sometimes called the South Financial District by real estate developers, or simply included as part of the Financial District itself. Under Spanish and Mexican rule, the area was the site of a harbor named Yerba Buena Cove with a small civilian outpost named Yerba Buena that served to support the military population of the Presidio and the Mission Dolores. The sandy, marshy soils of the tip of the San Francisco Peninsula discouraged the Spanish, and later Mexican governments from establishing a preeminent town there, who focused their pueblo settlement efforts in the Pueblo of San José with its extremely fertile land. It was not until 1835 that the first settlers established themselves on the shore of Yerba Buena Cove, with the first town plan surveyed in 1839. Yerba Buena's potential as a seaport made it the eventual center for European and American settlement. After gold was discovered in the Sierra Nevada Foothills in 1848, Yerba Buena's location on the natural harbor of San Francisco Bay acted as a magnet for European and American settlers, as well as gold and job seekers from a multitude of countries. Following Californian independence and American annexation and the California Gold Rush, the area boomed rapidly and the Bay shoreline, which originally ended near Montgomery Street, was filled in and extended to The Embarcadero. Gold Rush wealth and business made it the financial capital of the west coast as many banks and businesses set up in the neighborhood. The west coast's first and only skyscrapers, were built in the area along Market Street. The neighborhood was completely destroyed in the 1906 Earthquake and Fire (miraculously, the area's skyscrapers survived). By 1910, the area was largely rebuilt with low-rise, masonry-clad buildings ranging from six to twelve stories in height. During the late 1920s, several Neo-Gothic high rises, reaching three to four hundred feet in height, were constructed, including the Standard Oil Building, Russ Building, Hunter-Dulin Building, Shell Building, and the Pacific Telephone Building. With the onset of the Great Depression and statewide height restrictions due to earthquake fears, few new buildings were constructed, and the district remained relatively low-rise until the late 1950s. Due to new building and earthquake retrofitting technologies, the height restrictions were lifted, fueling a skyscraper building boom. This boom accelerated under mayor Dianne Feinstein during the 1980s, something her critics labelled as "Manhattanization". This caused widespread opposition citywide leading to the "skyscraper revolt" similar to the "freeway revolt" in the city years earlier. The skyscraper revolt led to the city imposing extremely strict, European-style height restrictions on building construction citywide. Due to these height restrictions, lack of buildable lots, and changes in the local real estate market, new development in the area has shifted to South of Market Street since the 1980s. The area south of Market, east of Third Street, north of Folsom Street, and west of the Embarcadero is sometimes called the South Financial District, or simply included as part of the Financial District itself. To encourage new development south of Market, and to help fund the replacement for the Transbay Terminal, many height limits were raised in the area. As a result, nearly all new high rise construction since the 1980s (and for the foreseeable future) has taken place South of Market. Notable examples include the JPMorgan Chase Building, 555 Mission Street, 101 Second Street, the Four Seasons Hotel, The Paramount, and the Millennium Tower. According to TRI Commercial, the traditional Financial District provides approximately 30,000,000 sq ft (2,800,000 m2) of office space, and the South Financial District offers about 28,000,000 sq ft (2,600,000 m2). Altogether, the combined Financial District employs over 220,000 office workers. The Financial District is served by more than two dozen Muni bus and rail lines, including one cable car line, as well as Montgomery Street Station and Embarcadero Station in the BART system. The nickname "FiDi" is occasionally employed, analogous to nearby SoMa. 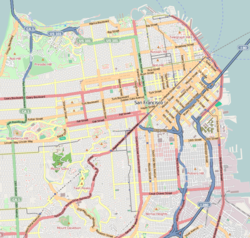 The area is commonly referred to as "Downtown" as well, although "Downtown" may include the broader Union Square, Chinatown, Tenderloin, and SoMa districts as well. 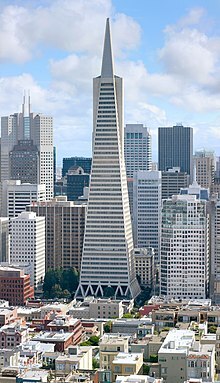 The Transamerica Pyramid was the tallest building in San Francisco from 1972 until 2017, when it was surpassed by the Salesforce Tower. The District is home to numerous corporate headquarters, including all six San Francisco Fortune 500 companies—McKesson Corporation, Wells Fargo, PG&E, Gap, Charles Schwab, and Salesforce.com— as well as Bechtel, the Union Bank of California, Levi Strauss & Co., Blue Shield, Kimpton Hotels & Restaurants, URS Corporation, and Bank of the West among others; and formerly Bank of America, Pacific Bell, Crocker Bank, Transamerica Corporation, Chevron Corporation, and Visa among others. The headquarters of the 12th district of the United States Federal Reserve is located in the area as well. Prior to their disestablishment, AirTouch, South Pacific Air Lines, Pegasus Aviation Finance Company, and the Pacific Exchange all had their headquarters in the Financial District. There are several shopping malls in the area, including the Crocker Galleria, the Embarcadero Center, the Ferry Building Marketplace, and the Rincon Center complex. Parks and plazas located there include Sue Biermann Park; Justin Herman Plaza, which is the current location of the city's New Year's festivities, and Transamerica Redwood Park. St. Mary's Square and Portsmouth Square are near the borders of the district, but are usually considered as part of Chinatown. Several consulates are located in the financial district. Countries with consulates in the Financial District include France, Brazil, Guatemala, Japan, Luxembourg, Mexico,Ireland, the Netherlands, Singapore, and the United Kingdom. The Taipei Economic and Cultural Office, of the Republic of China, is located in the Financial District. ^ a b "Financial District (FiDi) neighborhood in San Francisco, California (CA), 94104, 94108, 94111, 94133 detailed profile". City-Data. 2011. Retrieved 2012-12-03. ^ a b "Financial District (FiDi) neighborhood in San Francisco, California (CA), 94104, 94108, 94111, 94133 detailed profile". Urban mapping. Retrieved February 19, 2015. ^ a b Fortune magazine. "FORTUNE 500". Time Inc. Retrieved 12 February 2016. ^ King, John (June 20, 2006). "Kearny Street's timeless in its pedestrian way". San Francisco Chronicle. ^ Simonson, Sharon (March 4, 2013). "San Francisco City: Next 30 Years, SoMa Surges, Financial District Fades". The Registry. Retrieved December 27, 2013. ^ Hayes, Derek (2007). Historical Atlas of California. Berkeley: "University of California Press". ^ a b c d "San Francisco General Plan - Downtown Area Plan". City & County of San Francisco. Archived from the original on 2012-12-08. Retrieved 2012-12-27. ^ Toner, Robin (1990-09-30). "New York Times: California Showdown". The New York Times. Retrieved 2007-11-12. ^ "SAN FRANCISCO TRENDS: 2015 Q4" (PDF). TRI Commercial Real Estate Services, Inc. Retrieved 2016-02-12. ^ "World Airline Survey." Flight International. April 1963. 540. "Head Office: 311 California Street San Francisco, California"
^ "Contact." Pegasus Aviation. January 11, 2002. Retrieved on August 8, 2011. "Pegasus Aviation, Inc. Four Embarcadero Center, 35th Floor San Francisco, CA 94111 USA"
^ "French Consulate, San Francisco". ^ "Contact Information." Consulate-General of Brazil in San Francisco. Retrieved on February 1, 2009. ^ "Informacion de la mision." Consulate-General of Guatemala in San Francisco. Retrieved on December 14, 2009. ^ "Basic information on the office." Consulate-General of Japan in San Francisco. Retrieved on January 31, 2009. ^ "Japan Information Center." Consulate-General of Japan in San Francisco. Retrieved on January 31, 2009. ^ "." Consulate-General of Luxembourg in San Francisco. Retrieved on January 31, 2009. ^ "Contactenos." Consulate-General of Mexico in San Francisco. Retrieved on February 1, 2009. ^ "." Consulate-General of Ireland in San Francisco. Retrieved on June 2, 2009. ^ "Netherlands Consulate General in San Francisco, United States." Consulate-General of the Netherlands in San Francisco. Retrieved on June 30, 2012. ^ "Welcome." Consulate-General of Singapore in San Francisco. Retrieved on January 31, 2009. ^ "San Francisco." UK in USA. Retrieved on January 31, 2009. ^ "Contact Us Archived July 18, 2011, at the Wayback Machine." Taipei Economic and Cultural Office Los Angeles. Retrieved on January 31, 2009. 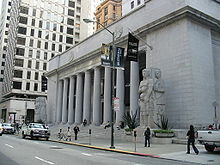 Wikimedia Commons has media related to Financial District, San Francisco, California.